This year’s four-day Philadelphia Folk Festival marked its 50th anniversary. If you ask a festival-goer at the Philadelphia Folk Festival what brings them to, or initially drew them to the festival, there’s a good chance they’ll tell you, ‘a friend.’ So when festival weekend rolls around, the town of Schwenksville is host to a huge gathering of friends, folk music lovers and family. “I’ve been here since 1982, I missed ‘93 and a couple years in between,” said festival volunteer Mike Michnya of Somers Point, N.J. Since 1961, Philadelphians and folk-music enthusiasts from across the country have been gathering at Old Pool Farm near Schwenksville, Pa. for the four-day campout and festival organized by the Philadelphia Folksong Society. This year, for the festival’s 50th anniversary, headlining artists included folk music legends such as The Levon Helm Band, Tom Paxton, Trombone Shorty and Arlo Guthrie. But younger, and perhaps less-established performers, like Jessica Lea Mayfield and Elizabeth Butters numbered among the 40-plus other performers who jammed on one of the festival’s six stages scattered throughout the site. “Philly Folk Festival creates unique moments – artists don’t play a set and go home. They teach workshops, teach a guitar style, world music or folk storytelling, and then you see their Main Stage performance,” said Levi Landis, executive director of the Philadelphia Folksong Society. 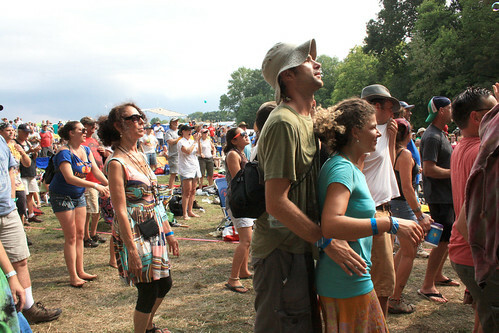 Philly Folk Festival-goers enjoy a show on Sunday at the Camp Stage, one of six stages that were in the festival area. A Sunday storm didn’t stifle the festivities, but provided a little downtime between performances. One Main Stage emcee remarked that it “wouldn’t be Folk Fest without rain,” as others reminisced about the 2009 fest dubbed “mudfest” by some, after a weekend filled with downpours. Some relaxed in a field of hammocks that lined the hill above the Main Stage, while others retreated to the Yards’ beer tent, or perused the food and craft vendors’ stalls. The festival’s 50th anniversary was a big deal for festival-goers and organizers alike. Volunteers and musicians didn’t hesitate to celebrate like with a happy birthday parade and each commemorated the landmark weekend in their own way. For those involved with the planning, several more formal celebrations commemorated the 50th, including a greening initiative. “It wasn’t just greenwashing– we implemented a compost program, had a solar powered stage, workshops to learn how to compost [and] a veggie-oil stage in the campground,” Landis said. “And the musicians were actually the ones pulling the compost down to the campground. The festival’s rich history doesn’t stop with the number of festies who return year after year; both the festival and Folksong Society have deep roots in American traditional music. “The important thing is to highlight the history. There are not many institutions that can boast 50 years, especially in the arts and entertainment world, and particularly with a mission that involves something like folk music,” Landis said. “[It was] a sit on your back porch and strum type of society and they thought let’s bring this premier type of event to it,” Landis said. Since its beginnings, the Folksong Society has placed huge emphasis on not only bringing folk music to those who already love it, but to those who might have never encountered it through free concerts, workshops and events. The Folksong Society isn’t only about Folk Fest, and they try to explore the same sentiments no matter what the event. “There’s a big emphasis on participation, it’s not as much a presentation model but participation,” Landis said. Though the 3,000 member-strong organization is up 800 members in the last three years, Landis expressed a difficulty in not only attracting today’s younger generations, but also staying true to the original mission of the society and the purpose that folk music holds. “They got away from it a little in the ‘80s and ‘90s, there was such a push to sanitize and be relevant and sort of abandon that [tradition] and be a little risky, connect to people,” Landis said. “They responded to the fact that not everybody wants to hear political songs, topical songs, but it’s an important part of our organization’s history that we like to continue to explore,” he added. Defining folk music and what it means to different people furthers the challenge of engaging pop culture in folk music. “One thing you have with folk music that’s a challenge is that it means so many things to so many different people; in the arts world everybody from singer songwriters to hip-hop artists use the term ‘folk’ to describe music,” Landis said. “It can be a frustration trying to navigate that, but we look at that as an opportunity: how will defining this help us gain members [and] push the envelope? That means everything from how we do workshops to how we describe what folk music may or may not be,” he added. But as generations return year after year to the Upper Salford farm, keeping the folk music sentiment, and a love of it alive, doesn’t seem to be a problem. Customers come to the Fairmount shop for the coffee, but stay for the entertainment.